As there is a lot of money involved, selling a Spanish property for many people is a stressfull experience. Times have changed and nowadays it´s almost impossible to sell your Spanish property if not “all legal requirements are met”. This, of course, according to the buyer’s lawyer. Besides of this, local, regional, national and international law changes constantly and the Spanish bureaucratic structure is rather complex. Also, correcting any administrative or legal issues therefore might take some time, so it´s advisable to be one step ahead at the purchasers. A lawyer can take care of the total legal investigation for you, as he is a real specialist in property law (conveyancing). This also includes arranging the DAFO certificate for rustic propeties. Besides the legal investigation, the lawyer also negotiates on his client´s behalf with the buyer about important stipulations of the sale. Through a ´Power of Attorney´ he can legally represent you and defend your interests during the whole sales process. Based on his experience he will do so in a professional way, also if you´re not in Spain yourself during the process. Together with the (lawyer of) the buyer he deals with the private purchase contract and the signing of the public title deeds. Another advantage is that the solicitor can handle all kinds of financial, fiscal or banking issues like a mortgage cancellation, payments, retentions and tax issues. Checking possible debts like mortgages, seizures, non-paid taxes, etc., as these would automatically be transferred on to the new owner through the sale. Once you have reached a price agreement with the buyers, there´s still many issues left to negotiate to be able to come to completion. Depending on the current status of your property, it might be necesarry to negotiate about all kinds of administrative procedures for example like New Build Declarations, Cadastral corrections or applying for the the DAFO certificate (rustic). Your lawyer will defend your best interests in these agreements and will arrange the procedures. Through the Power of Attorney your lawyer can check all conditions and sign private contracts as well as the public deeds on your behalf. Apart from the language aspect of course only a lawyer can determine if the contract of the buyers doesn´t have any hidden surprises and is legally binding according to the Spanish law. If you still have a mortgage on the property and the buyer has no interest in it´s subrogation, it needs to be arranged with the bank to sign the mortgage cancellation deeds, so the property can officially be sold without open debts according to the Land Registry (Registro de la Propiedad). During completion a seller almost never gets a bank cheque with the full sales price. The payment for the real estate agent(s) must be calculated and reduced together with temporal retentions or reservations for estimated future costs for the account of the seller. This can be IBI, Plusvalia, 3% Capital Gain Tax (downpayment), water / electricity, a and the DAFO certificate (with septic tank). Your lawyer will make sure that you get your balance for these costs and that any money left will be paid back to you. Because of the deal C&D Solicitors has with the bank, you won´t be charged high bank commissions for the transfer(s) abroad. Another reason to hire a lawyer for your sales is that he will ensure your the timely and correct tax payments so you won´t be at risk of any fines. The Plusvalía is a local tax calculated over the increased value of the land that has to be paid when selling a Spanish property. The Impuestos Ganancias Patromoniales is the national Capital Gain Tax of 19% (for EU residents). It is calculated over the increased value (the profit) of the total property according to the purchase price in the Title Deeds of the notary. Certain reductions are allowed for which your laywer makes a calculation. In case you aren´t a fiscal resident in Spain (or can´t officially prove this to the notary), the buyer has the legal obligation to deduct 3% of the purchase price as a down payment for the Capital Gain Tax. Afterwards you might be obliged to pay an additional amount or -in case of selling with a loss- you might be able to get this amount back from the Tax Office. In this last case it necesarry to prove that each owner has paid his IRNR income tax for non-fiscal residents over the last 5 years. If you are tax resident in Spain you have to declare the profit you made with the sale in the next year´s IRPF Income Tax Return and we will be happy to look over any possible deductions regarding your personal situation. 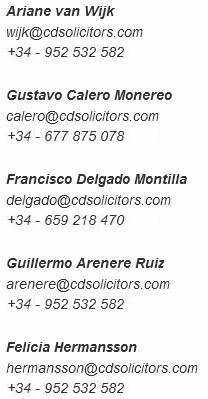 Over the last ten years our law firm has built up a lot of experience in selling properties for our clients in the Axarquia area, where we have our office in Torrox-Costa. This area consists the eastern part of the Malaga province with towns like Nerja, Frigiliana, Competa, Viñuela, Velez-Malaga, Arenas, Alcaucin, etc. However, we also offer our services for selling your Spanish property on the rest of the Costa del Sol (Malaga province), Costa Tropical (Granada province) and Andalucia. Please don´t hesitate to let us know if you have any questions or if you are interested in a first (free) meeting in our office.